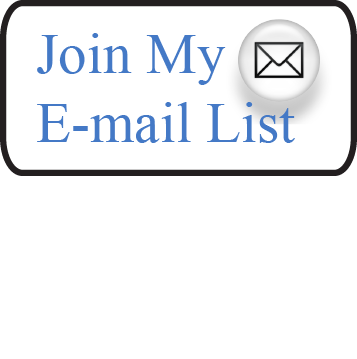 When I was an art student studying in New York City I dreaded having to purchase cadmium colors — as the proverbial starving artist I cringed at the price tag for them. At that time any money was too much money. But at some point I decided they were necessary and justified buying a cadmium red and a cadmium yellow light. I made do with just those two pigments for a number of years and they gave me that extra punch of chroma or intensity whenever I needed it. After awhile I found them a necessity for many projects. At some point I ended up also adding cadmium orange to the mix. But still every time I went to repurchase them I found myself cringing at the price tag. However, by this point we had become old friends and despite the price I was so accustomed to their hue, value and chroma attributes that I automatically added them to my cart without much reservation whenever I needed a new tube. 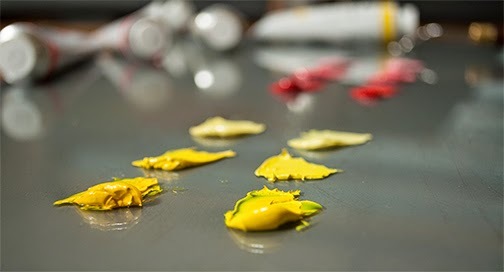 A couple of months ago I started doing some tinkering with the colors on my palette and decided that I might look into some alternatives for my cadmium paints. And after trying a handful of different colors I finally settled on replacements for cadmium red and cadmium yellow light. I thought I’d share those results in case there are others out there who also wanted to begin phasing out their cadmiums. 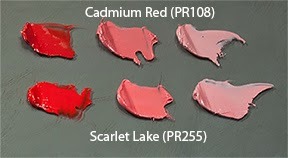 For cadmium red (PR108) I’ve replaced it with Scarlet Lake (PR255), also known as coral red or sometimes Pyrrole Scarlet. From the reading I’ve encountered it appears to be quite lightfast receiving an “ASTM I rating.” I like that although its hue is very similar to cadmium red light (which makes it feel familiar to me) its chroma is actually a bit higher and continues to hold up well with the addition of white paint — at least as well as the cadmium red I’ve been using. 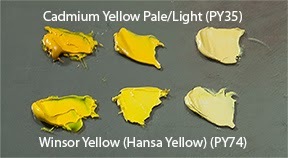 For cadmium yellow pale/light (PY35) I have replaced it with Winsor yellow (PY74), also known as Hansa yellow, Arylide Yellow or Azo yellow. 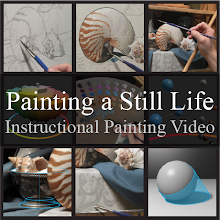 This one also receives an “ASTM I” rating which I’m pleased about. And although its hue appears to display slightly less of an orange trace, when compared to cadmium yellow light, it is still close enough in hue that it, again, feels familiar to me. It also has a slightly higher chroma than cadmium yellow light, giving me just a touch more color-space range. Now if the characteristics above were not enough to get me to make the switch, the price for them added that extra incentive I needed. Both of these generally run under half the cost of their cadmium counterparts, and for the remnants of that starving artist I once knew so well, this makes me very happy! Despite trying a few alternatives I’ve still yet to find a good replacement for cadmium orange — so I suppose it will still linger on my palette until I do so. If anybody has found a good replacement for it I would love to hear your suggestions.